OT Resources for Students & Professionals: An Interactive Infographic! 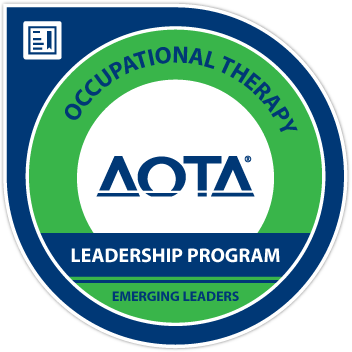 Are you an OT student or practitioner looking to improve your practice, increase your success, and give back to the profession of occupational therapy? …and much, much more! So click on the image or the Resources tab above and check it out, and please share with your peers, coworkers, and friends in OT! BadgeBlooms: A Fun Way to Celebrate the First Day of Spring! Isn’t my OT BadgeBloom beautiful? I love it! Mine is fun and floral, but they come in all kinds of styles, shapes, and patterns! Happy first day of spring! Although apparently it’s snowing in some places on the East Coast and it’s not all that warm where I am, I’m glad that nicer weather is finally on the way after Snowpocalypse 2015. I’ve been meaning to write this post for a while (like since Christmas), but I’m just now finding a minute to sit down and post about something cool I discovered around the holidays! Last Christmas I was looking for a nice, inexpensive gift for my friend who is in speech-language pathology school, and I really only believe in spending money on gifts that are going to be functional for their recipients. Clearly I was destined to be an OT from the day I was old enough to start getting other people gifts, LOL. Anyway, I wanted to get something that would be useful to her in her academic and professional life, that she would like, and that was fairly inexpensive. And after a little bit of sleuthing to find good gifts for graduate students, I happened to find the BadgeBlooms shop on Etsy! Badgeblooms is a business owned by a woman in Chicago who designs fun ID badge holders & reels for healthcare workers and other personnel. 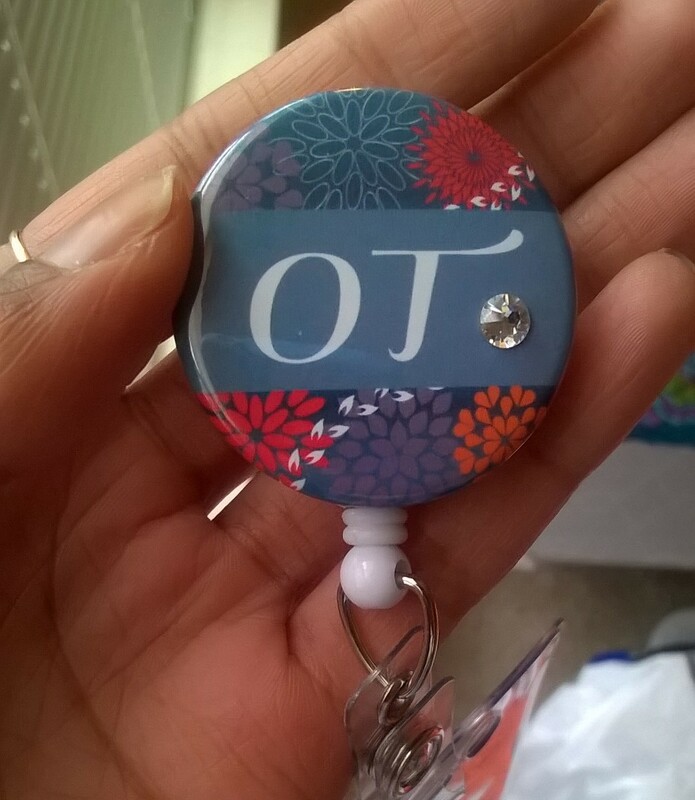 She has them in all shapes, sizes, themes, and colors, and they can even be customized for people who work in a particular profession (like my custom OT badge in the picture above). As most healthcare employees are required to do, I have to wear my ID badge when I’m on fieldwork seeing clients and interacting with families so that I can be easily identified as a person who belongs. Unfortunately, as an occupational therapy student working in settings alongside a variety of other professionals, I have often been mistaken for a nurse, PT, and even the parent of a client! Although nobody meant any harm when making these honest mistakes, I wanted to do something to be more proactive about letting people know who I was and why I was in the room or working with their child. Having a customized “OT” BadgeBloom has been a great talking point and has spared me some confusion when working with people in busy settings alongside multiple other professionals. If you’re concerned that BadgeBlooms are too pretty to be tough, have no fear! I try to take care of my things, but between me running after kids in the clinic, chasing down the bus, throwing it in my junky bookbag, and losing it in my bedroom, my BadgeBloom hasn’t always been well-treated. However, it is sturdy and has held up very well for the past few months. So if you’re in the market for a fun, functional gift for a friend, family member, coworker, new occupational therapy/healthcare student :D, or yourself, a BadgeBloom might be just what you’re looking for! They also come pre-packaged in a cute little box when you buy them, so you can just ship it straight to its recipient without even worrying about gift wrap! Additionally, if you like the BadgeBlooms Facebook page you can get a discount on your purchase! Check out the Etsy shop – and its hundreds of options – and good luck making a decision about which one to get! Disclosure: I was not compensated by BadgeBlooms for this post. I just really like my lovely ID badge holder and supporting small business owners! Pediatric occupational therapists often work with clients who have difficulty with feeding, eating, and/or swallowing as a result of physical differences, behavioral issues, or psychological disorders. Yesterday was quite an unusual day for fieldwork, as I was able to observe an initial evaluation session with a young client who was being treated for an eating disorder. When my classmate/fieldwork partner and I initially heard the diagnosis, I think both of us immediately jumped to conclusions about the client we would be seeing. This is probably due partly to our own personal experiences both in and out of the OT clinic, but also by the dominant narratives about people with eating disorders that are shown in popular media. In my experience, I have really only seen shows and read narratives of young (middle school to high school age), Caucasian females with disordered eating habits. However, the client we saw fit few of these stereotypes! ARFID was introduced as a new diagnostic category in the recently published DSM-V. The ARFID diagnosis describes individuals whose symptoms do not match the criteria for traditional eating disorder diagnoses, but who, nonetheless, experience clinically significant struggles with eating and food. 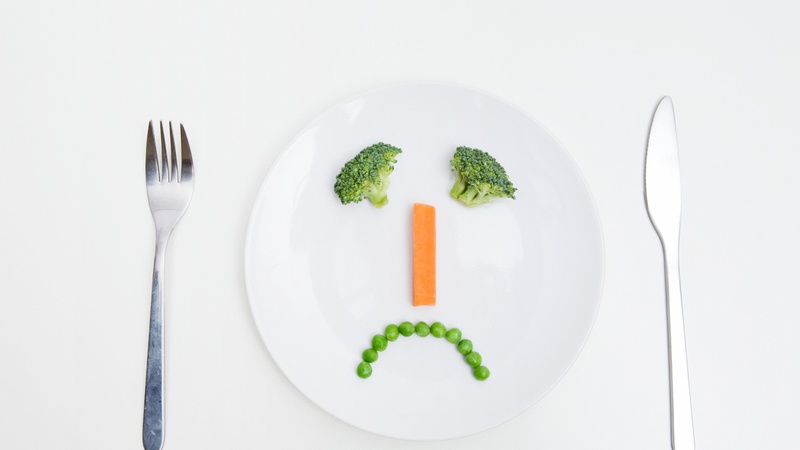 There are many types of eating problems that might warrant an ARFID diagnosis – difficulty digesting certain foods, avoiding certain colors or textures of food, eating only very small portions, having no appetite, or being afraid to eat after a frightening episode of choking or vomiting. And most of all, individuals with ARFID may have problems at school or work because of their eating problems – such as avoiding work lunches, not getting schoolwork done because of the time it takes to eat, or even avoiding seeing friends or family at social events where food is present. 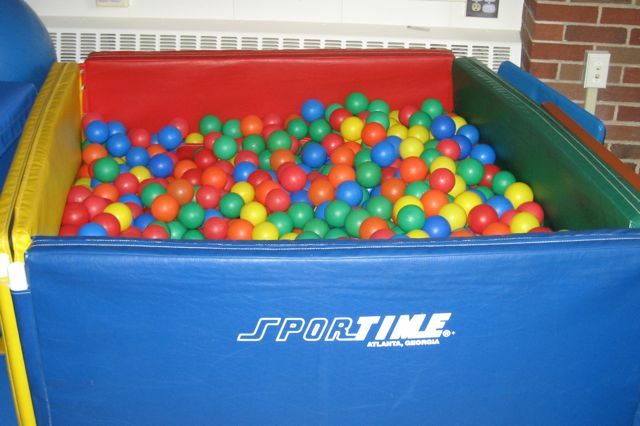 Pediatric therapy fieldwork is just like this ball pit. It’s all fun and games at first, but you have to beware of the hidden dangers! So my second round of Level I fieldwork began at 7:45 AM today, and it was a whirlwind of an experience! I was at a large research hospital’s outpatient pediatric clinic, and I probably saw about 7-8 kids today. For my spring Level I rotation, my program has me in two different sites for 10 weeks total, with myself and a classmate/partner spending five weeks at each site. Until March, I will be spending one day per week at this first pediatric site, and after spring break I will be at a new site with a new partner. The “partnering” and “50/50” fieldwork is new to my program, but I enjoyed having another person to talk to and bounce ideas off of today as I observed the therapists and engaged with the kids. While my CI “Jay” was a friendly, experienced therapist who had been practicing for 10+ years, a lot of the things I saw in her practice and the setting in general were somewhat disconcerting and at times discouraging to me as a budding OT. However, because I believe in having a strengths-based approach to life and other pursuits, I’m going to start with what I liked about working with Jay and my classmate “Lily” at the site! This is what I was told by one of the kindest, coolest OTs in the hospital where I’m currently doing FWI, as I struggled in out of the cold 2 hours late and looking for my supervisor. While she paged him and let him know that his lost sheep had finally arrived, I was able to relay the story of what went on this morning for her benefit. Basically, this week of fieldwork has been one big fat mess after another for me, and it’s been really terrible! First, on Monday, I randomly almost passed out while we were with a client and walking him around the floor. It happened in like 10 seconds — one minute I was standing there, listening to my CI (clinical instructor), and the next my head was spinning and I was stumbling over to the nurses’ station to sit down and try to collect myself. For whatever reason, at that particular moment I was overtaken by a sudden spell of nausea, dizziness, and hot and cold flashes that really had me feeling sick. It was AWFUL. When he finished with the client, my CI came over and asked if I was okay. At that point, I was feeling pretty strange and lightheaded, so he walked me over to the nearby Student Health clinic and left me there to sort things out. A couple of hours later, I was discharged and told that I should probably take a snack with me on future days. …I missed half a day of fieldwork to be told that my blood sugar was low? REALLY??? And then, just because Wednesday didn’t want to get outdone, things got even worse this morning! I went down to my car to leave this morning, found that it was covered in ice, and emailed my CI to let him know that I would meet him a little later than we had planned. At this point, everything went to hell. I went back to my apartment to find something to scrape with, and when I did I happened to close the door of my car. With the keys in the ignition. And the car running and heat going FULL BLAST. Upon realizing this, I died a little inside and seriously considered just punching the window out of the car in my frustration. Instead, I just went upstairs, woke my (peacefully sleeping and very kind) roommate up at 7:30 AM, asked to use her phone, and went to work with an unbent wire hanger trying to let myself into my car! After a half hour of fail, my roommate came out and gave me her phone and spare key. I’ve only known this girl for four months, and already she’s done so much for me! Today might have actually been her finest act of kindness yet. With her phone, I managed to call my mom – the only local number I have memorized – and informed her about my sad situation. I then waited another hour and a half for her to contact our insurer, get THEM to call a locksmith, and have the locksmith arrive around 9:20. And then watch the locksmith basically use a larger, slightly thicker piece of metal to do the same thing I had been doing for the past hour, with the exceptional difference bring that he actually succeeded in getting the door open. Finally, I drove my car to the site and eventually found myself telling the whole crazy thing to the kind therapist I mentioned earlier. She was simultaneously shocked, sad for me, and certain that “life happens” and the best thing we could do was just move past it! We then had a lovely time talking about her significant other and his life as a fisherman, and just like that it was all water under the bridge. VideOT: How Do You Feel About Hirudotherapy? Note: The video for this VideOT post wouldn’t embed in WordPress, but it is linked below! 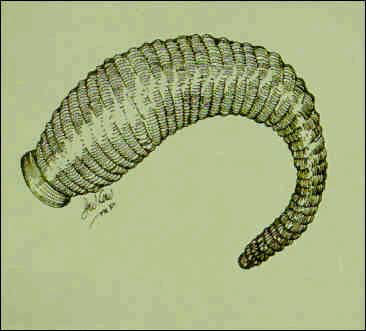 A drawing of a typical specimen used in hirudotherapy. This past week I was on my Fieldwork I assignment, working with an occupational therapist in an acute care setting in a large hospital. While I was there, I heard a therapist talking about a treatment so ancient I never thought I’d see it in a modern hospital! The treatment is called “hirudotherapy,” and it involves putting LEECHES on a client to facilitate healing!!! I was shocked, but then a nearby PT confirmed that leech therapy occurred commonly at the hospital he had previously worked at. After doing a little research, I learned more about why hirudotherapy can be an effective treatment – when done appropriately and by trained professionals. As I mentioned, hirudotherapy is an ancient practice that has been around for thousands of years and used by people and civilizations around the world, from Egypt to Greece to the early Americas (Abdualkader, Ghawi, Alaama, Awang, & Merzouk, 2013). For the next three days, I’m going to be completing the second part of my first Fieldwork I rotation at a local hospital’s acute rehab unit. For this particular rotation, I’ll be working from 7:30 to 4:30 and completing a fieldwork assignment that will require me to interview a client and analyze a task that they perform. I’m kind of nervous, but I’m gonna fake it til I make it and hope all goes well! I am taking the final exam for my neuroscience course. It’s pretty stressful trying to study and finish the online exam before everything else that’s going on this week, but I feel like I am decently prepared and hoping for the best! I’m starting a new bellydance class. I really missed engaging in this occupation, and I’m hoping that taking a class will help me de-stress and meet some new friends in the area. In the midst of all that, I’m going to try and do at least a couple blog posts, but I’m not sure how that’s going to go. I’m still struggling to find a work-life balance that works for me, and coming straight to graduate school from undergrad is making that a little harder than I thought it would be. I kind of figured that I would have an advantage over many of my classmates who had been out of school for several years, because I would be more prepared for the daily grind of class, homework and studying. While I do feel like I’m doing well academically, I’ve actually been having a pretty difficult time outside of class just finding friends and opportunities to relax. Honestly, since I graduated from college and moved to a new town where I knew nobody except my mom (who’s a little too far away to see regularly) and a couple of her family friends, it’s been kind of lonely. It’s strange, because I spend most of my time in class or at work, where I’m surrounded by people, but when I go home I’m finding that I really miss the leisure activities and social connections that I had in undergrad. Since starting grad school, I went from living with three other roommates in an on-campus apartment to living with one roommate in an off-campus complex. Instead of managing and being a part of several clubs, I am now struggling to find time to complete all my homework assignments thoroughly, complete class projects and study for exams and quizzes each week. I feel like I’m still constantly busy, just not with the same kind of stuff I was in undergrad – the leisure part of my life has all but disappeared. However, being the proactive person that I am, I decided a couple weeks ago that I was going to try harder to make friends, go out, get out and find time to do things that I enjoy. So last week I invited a classmate to a local bellydance event and also attended an on-campus meeting to learn more about having a good relationship with my faculty advisor. I also signed up to take a bellydance class at a local studio, and even though taking the class is going to take up several hours of my week for the next six weeks, I’m hoping that picking up something I love again and taking advantage of an opportunity to meet new people and try new things will be good for me! One of the things I’ve struggled with most since moving here was not being able to continue dancing, and now that I’m going to be filling that void I hope that I’ll feel better. I’m also actively trying to make plans with classmates, instead of just sitting back and waiting to be invited to things. This particular lesson is one that I learned early in my undergraduate career, back when I was a lonely freshman who spent many nights listening to others laughing and chatting on their way to and from various events and wishing I had been invited to go along. It’s a little different inviting people to events in grad school, just because people live in different places and have different obligations, but I’m trying! Although my program is one of the smaller ones in the country, there are enough people in it that I can find friends and begin building a new social and support network here. It’s just more up to me to initiate activities and make plans now. All of the new grad friends I’ve talked to have said that they’re having difficulty with the post-grad transition too, which makes me feel less alone. It’s hard leaving a life where I was surrounded by friends and social opportunities all the time for one where I feel like that’s not the case, but I’m surviving. I’ll keep you posted on how I’m navigating the post-grad world, and how this crazy week ends up! Using Your Occupational Therapy “Elevator Speech” to Effectively ELEVATE Understanding of the Profession!